Excalibur Flying Tourbillon Chronograph with single-pusher model was launched as a tribute to a tribute to the Geneva Seal, which celebrated its 125th anniversary in 2011. This limited edition timepiece is the first ROGER DUBUIS timepiece to meet the new requirements of the Geneva Seal unveiled on 9 November 2011. It is also important to note that, now ROGER DUBUIS is the only watchmaker to have every one of its movements stamped with the Geneva Seal, the pledge of handcrafted excellence. 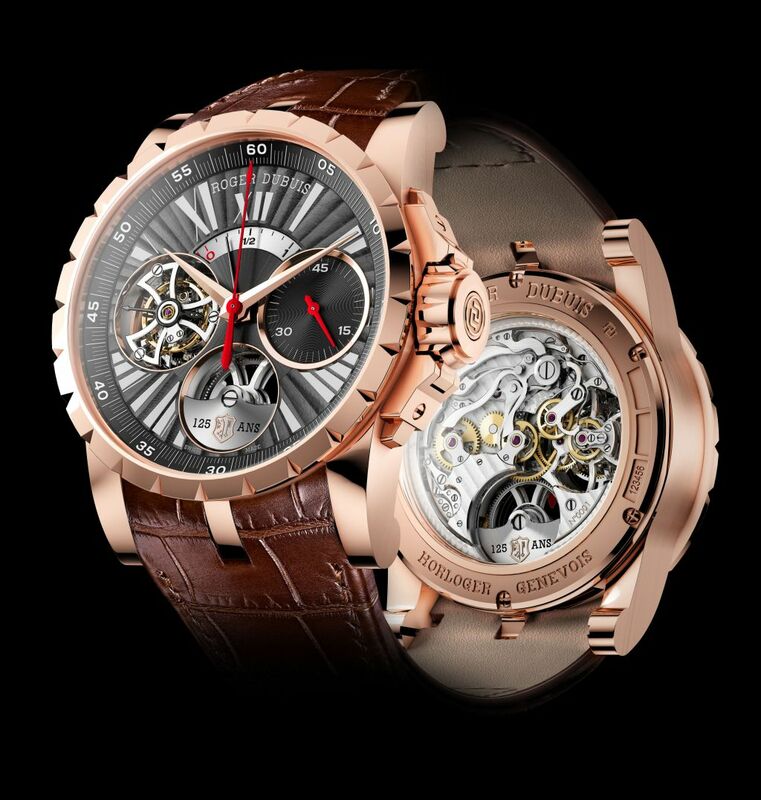 The Excalibur Flying Tourbillon Chronograph with single-pusher and power reserve display is equipped with the new RD580 calibre and produced in a limited edition of just 8 pieces, this outstanding model will be the brand’s first timepiece to obtain Geneva Seal certification according to the new, even more demanding specifications. From 2012, all new ROGER DUBUIS models will fulfill the new requirements that must be met before Geneva Seal certification is awarded. This new Chronograph with Flying Tourbillon and single-pusher, housed in a 45 mm diameter pink-gold case, is the perfect incarnation of the avant-garde spirit that personifies the Genevan Manufacture. In addition to the flying tourbillon at 9 o’clock, the power reserve display at 12 o’clock and the 45-minute chronograph counter at 3 o’clock, this new arrival in the Excalibur collection is distinguished by its platinum micro-rotor, visible from the dial side of the watch. And exceptionally, this oscillating weight bears in full view on its exposed portion the Geneva Seal – normally stamped only on the movement – supplemented on either side with the inscription «125 years». The Geneva Seal officially came into force in 1886; and in 2011 on its 125th anniversary new requirements outlined. Bestowed by the State of Geneva on a select few watchmakers, it constitutes the official guarantee that the mechanical watch movement is hand-made, assembled and regulated in Geneva and that it respects the strict requirements of handcrafted excellence in watchmaking. Every component of a movement bearing the Seal is hand-finished and finely decorated, even those that are never exposed to view. The new requirements outlined by the Geneva Seal – unveiled on 9 November 2011 – focus even more closely on customers and their expectations. While the conditions imposed up to now remain unchanged, new requirements now complement them. Principal change: from now on, the entire watch is Geneva Seal certified, no longer the movement alone. In addition, the Geneva Seal now certifies the functions claimed for the watch, for example water-resistance or the power reserve display.